Hospital, Abuja, and appealing for help from the FG and Nigerians to help offset medical' bills and deal with the children. 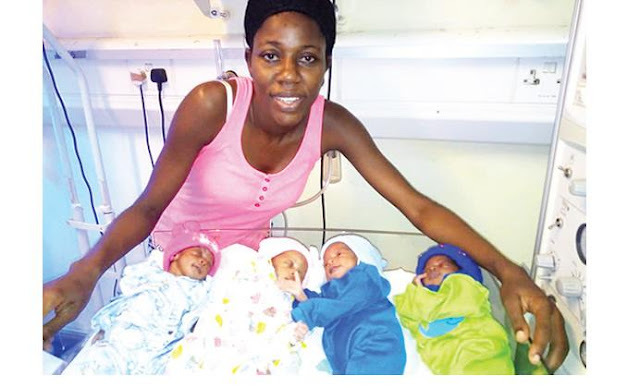 Their mother, Mrs Temitope Amodu, a 30-year-old teacher, was delivered of the all-female quadruplets on October 25, 2018. Speaking with The Punch on Monday, the Kogi State indigene expressed fear that the situation would become worse for her and the babies should the labour strike commence today (Tuesday) as scheduled. She said, “I am a teacher in a private school and the job is not secure. At a point, I had to take a leave without pay. My husband is an officer of the Nigeria Security and Civil Defence Corps. Before I got the teaching job, it was his meagre salary that we managed and life has not been easy. My first child is three years old; it was because of the economic situation that we decided to delay further childbirth till now. “Despite that, God in His faithfulness still gave us these babies. I call on everybody: organisations, churches, government and individuals, to please come to our aid. We cannot do it alone. These children are everybody’s; they are God-given. I call on Nigerians to please come and help us. It is an urgent need. Apart from the bills – the National Hospital is so expensive and their bills are different from that of my regular hospital – there is the issue of feeding. She also said based on medical advice, a bigger accommodation was required to ensure the safety of the babies. “Where we live is a room and parlour, with a little space like a store, which we cannot call a room. Meanwhile, the paediatrician said the babies need a room to themselves; that if not, we might be having challenges,” Temitope added. Her husband, Mr Ernest Amodu, who said he was serving at the Ondo State Command of the NSCDC, also solicited help from the government and Nigerians. Ernest, who also hails from Kogi State, said, “Having a child who is three years old, I know how tasking it is to raise him. To have an additional four is a lot of demand. “In the last one week that we have spent in this hospital, it has not been an easy experience. The bills are quadruple. Every service is paid for five times for the mother and the babies. If you want to help the family, they are at National Hospital, Abuja.